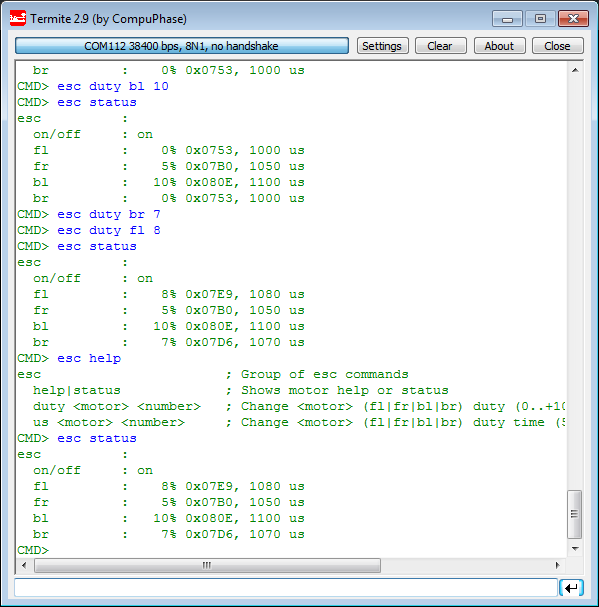 BEC stands for ‘Battery Elimination Circuit’: basically it means that the ESC can provide me a 5V power with up to 1A from the battery voltage. That way I can power things like the FRDM board on the quadrocopter with that 5V and do not need a dedicated power supply or battery :-). The 5V is provided to the red (5V) cable of the Servo cable. Later I will use that 5V to power the FRDM-K22F board. 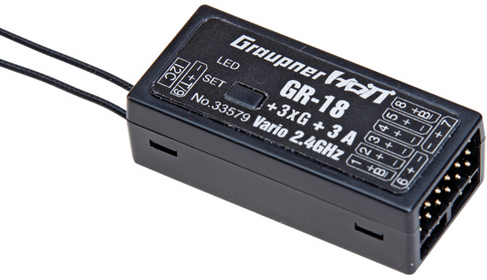 Such a receiver gets the remote controller signal and then sends the PWM signal to the ESC’s. I plan to use such a receiver and use the SUMD (combined digital signal of the servo) to be feed into the FRDM-K22F. That way the FRDM can receive signal from a normal remote controller (beside of Bluetooth and nRF24L01+). 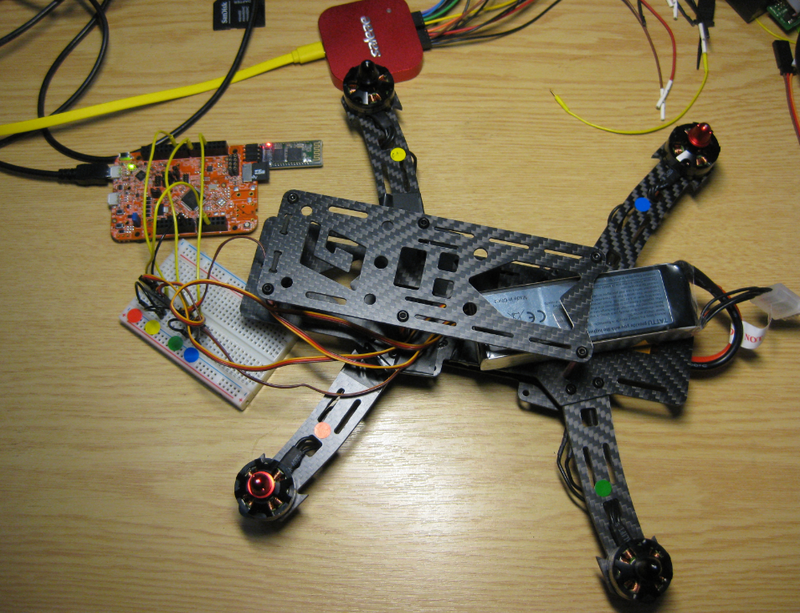 I plan to use the Bluetooth and nRF24L01+ for diagnostic data and to drive the Quadrocopter inhouse. But for larger distances and outside I plan to use a normal remote controller. The pulse width minimum and maxium value can be configured with a calibration routine (see http://robots.dacloughb.com/project-2/esc-calibration-programming/). For the quadrocopter I would like to use a range as big as possible between LOW and HIGH. 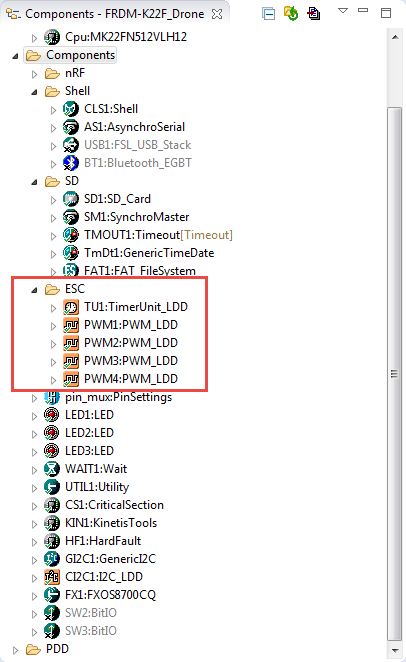 Send a PWM signal for ‘max throttle’ to the ESC (say 2000 μs PWM duty). Power the ESC from the battery. The ESC beeps twice to show that he detected the signal. The ESC stores this as ‘maximum position’. Now within at least 2 seconds, send a PWM signal for the low signal (say 1000 μs PWM duty). The ESC peeps for a long time to show that low position is recognized and stored. Power up the ESC with a PWM signal for ‘min throttle’ to the ESC (say 1000 μs PWM duty). The ESC beeps once to show that he detected the signal. Using an ESC makes it easy to drive a brushless DC motor for a quadrocopter: I need to supply a PWM signal to the ESC, and the ESC will drive the motor. Next step will be to use the gyro, magnetometer and accelerometer on the FRDM-STBC-AGM01 with the FRDM-K22F. The current state of the project is posted on GitHub. This entry was posted in ARM, Boards, CPU's, Embedded, FRDM-K22F, Freescale, Graupner Alpha 250Q, KDS, Quadrocopter, Robots, Tips & Tricks and tagged Drone, FRDM-K22F, freedom board, Freescale, Quadrocopter by Erich Styger. Bookmark the permalink. 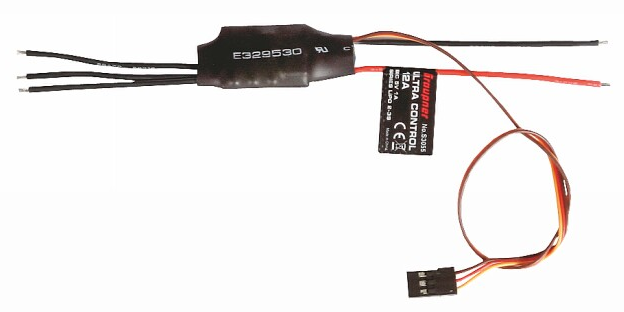 Hey man, i’ve been thinking about starting my own drone with controlled by an arm mcu but i was wondering: Does every esc need a separate battery or can you power the 4 of them with just one? You can use one battery with multiple ESC’s. Only make sure that the battery is able to provide enough current for all of them. wow i didn’t notice the time difference between us, Mr. Erich, i thought that i was going to get an answer tomorrow haha. So if i have 4 30A ESC, i need a 120A battery? Yes, your battery has to provide that in the worst case.